The Defence of Heaven brings together, for the first time in one volume, a complete history of the Jin, Song and Ming dynasties’ wars fought against the Mongols. Lasting nearly two centuries, these wars, fought to defend Chinese civilization against a brutal and unrelenting foe, pitted personal heroics against the inexorable Mongol war machine and involved every part of the Chinese state. The resistance of the Chinese dynasties to the Khans is a complex and rich story of shifting alliances and political scheming, vast armies and navies, bloody battles and an astonishing technological revolution. The great events of China’s Mongol war are described and analyzed, detailing their immediate and later implications for Chinese history. In this excellent new book, James Waterson tackles this fascinating subject with characteristic verve and skill. Setting the Mongol war in the wider context of China’s ancient and almost perpetual conflict with the northern nomads, it sheds light on the evolution of China’s military society and the management, command and control of the army by the Chinese state. James Waterson was born into a London family of Royal Marines and Paratroopers. Fatherly advice however steered him away from a military career and into academia and teaching. He is a graduate of the School of Oriental and African Studies, University of London and received his Masters degree from Dundee University. He worked and taught in the United States and China for a number of years and now divides his time between the Middle East and Italy whilst trying to makes ends meet. The Ismaili Assassins is his second book and grew out of his travels in Iran. His first book, The Knights of Islam, a history of the slave soldiers of Islam, was published in 2007 by Greenhill Books. He continues to work at producing a life of the Crusader Bohemond of Taranto but knows it will never be finished. "Waterson’s treatment is clear, a considerable achievement considering the often very complex ways in which events unfolded. He links the events in China to contemporary developments in the rest of the world, sometimes in startling ways (e.g., the “movements” of the trebuchet). Waterson often explains events in China by comparing them with similar developments in other parts of the world, which is a considerable help for anyone who is a novice to Chinese history. And Waterson is not shy about criticizing Western perceptions of China (e.g., just how familiar were Chinese generals with Sun-Tzu?). 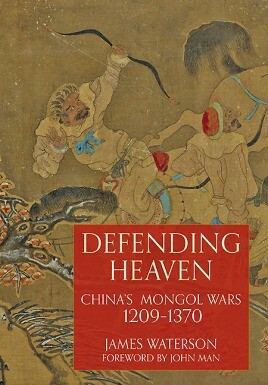 Defending Heaven is a good read for such novices, but also will satisfy the more seasoned student of Chinese history."